The prayers of Preacher fans have been answered. Today, AMC announced they’ve renewed the series for a second season. 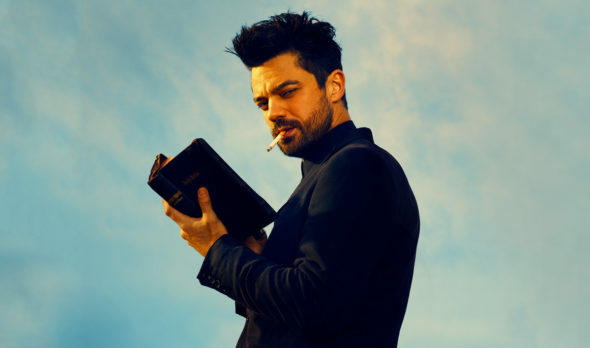 Based on the comic by Garth Ennis and Steve Dillon, the comic-drama follows Jesse Custer (Dominic Cooper), a small-town Texas preacher who becomes possessed by a mysterious and powerful force. The cast also includes Ruth Negga, Lucy Griffiths, W. Earl Brown, and Joseph Gilgun. Only five episodes into its first season, Preacher hasn’t been receiving the highest ratings. So far, the series has earned an average of .66 in the 18-49 demo and 1.755 million viewers. What do you think? Are you watching Preacher? Are you glad the series has been renewed? I love Preacher! Hopefully it will renew for many seasons! Yes the show is awesome I love it definitely renew for season 2 give me a hell yeah!!! Great show!! Just needs time. Oooooooo…..I was SO incredibly mad when I found out that one of my new Favorite shows was cancelled! I instantly fell in love with more than one character. The acting was done so well. Photography? GREAT! And the setting always made my feel creepy, hot and thirsty. Well done! Please do this to me every week for a very long time. Thank the Lord for the creators, actors and all those in the background who have brought so much enjoyment into the lives of others. Need more Preacher!!! Loved it so far. I’m a senior and never read the graphics but thought the first season was awesomely funny and twisted! Love Dominic’s character! Season 3 please! Can’t wait to see see season 2. Yes I love the show it is totally different!! Growing up in church I am always interested in religious based TV shows I love all the charters. Love this show! Can’t wait to see it again. We are so glad it will be coming back. Alot of shows were canceled that shouldnt have been. Preacher is one of our favorites.